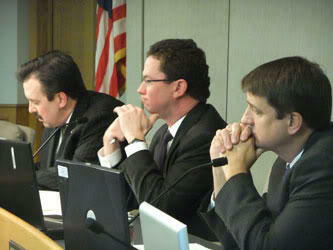 Hamilton County Commissioners are hammering out the 2013 budget. Lone democrat Todd Portune released his proposal today/yesterday. Key to his 5-year plan is generating extra funds through a state provision allowing counties with land banks to issue securities based on expected tax revenues. "While the use of this vehicle is limited to counties that are land bank counties, nowhere in the legislation, and nowhere have I found, are the use of the proceeds limited to just land bank activities," he says. "If I'm right in that, and I believe I am, then there is the opportunity for 2013 for not only Hamilton County but for the other taxing authorities like the townships, like municipal corporations, like school districts to get a bump in their revenues for next year as well." Portune's spending plan isn't likely to find much traction with the rest of the board. Commission President Greg Hartmann already introduced his own proposal and has support from fellow Republican Chris Monzel. However, Hartmann says he'll look into Portune's idea for land bank securities. After rejecting three proposed budget options put forward by the county administrator, Hamilton County Commissioners plan to offer their own spending plans Monday morning.